2017 release. As in the game with the same title, the goal is to climb to the top. This is what Shakra as a band also have in mind. It's been almost two years since High Noon was released, the comeback album with former lead singer Mark Fox back on the microphone. High Noon made it to #2 in the Swiss album charts and also entered the German charts. The haunting melodies, the distinctive voice of Mark Fox, the striking guitar riffs from Thomas Muster, the emotional solos from lead guitarist Thom Blunier and the irresistible grooves from Drummer Roger Tanner and bass player Dominik Pfister are all typical Shakra trademarks, which can be found again on Snakes & Ladders. The opener Cassandra's Curse, which lyrically is about the current world affairs, is a perfect example of all the trademarks mentioned above. Heavy riffs, an atmospheric verse and a powerful refrain. The kickass rock song Friday Nightmare is followed by the title track Snakes & Ladders. 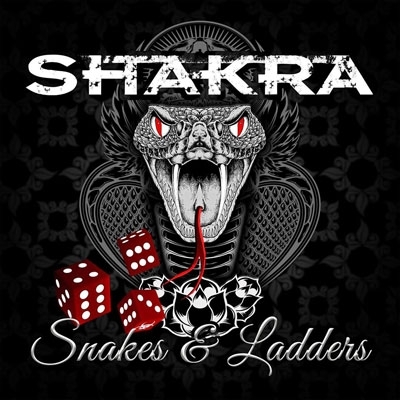 All in all there are 12 brand new Shakra tracks on Snakes & Ladders. Shout out some singalongs to The Seeds, feel the blues in Rollin, listen to the straight rock 'n' roll song Medicine Man or just rock out to I Will Rise Again and Fire In My Veins. We are sure every Shakra fan will be more than happy with the album. So Shakra are definitely back on track!